Send work orders / job (in electronic form) to the field that have a key information, such as location of work, description of the work to be done, scheduled due date and time, special notes, filled in advance. Receive: The field worker completes details on the work order of work done, time spent, materials used and the work order is updated for the office. Prepare the Invoice, update Quick Books or Simply Accounting. Mail or e-mail the invoice to your customer. Run reports to see how you are doing. Print time sheets. Access history when your customer has a question. "...It's super easy to get going..."
With your web browser you are the Office. For the Mission Control Center all you need is a PC with an Internet Connection. Your existing PC or Laptop is fine if you have web browser and an internet connection. Arm your field users with a mobile device. 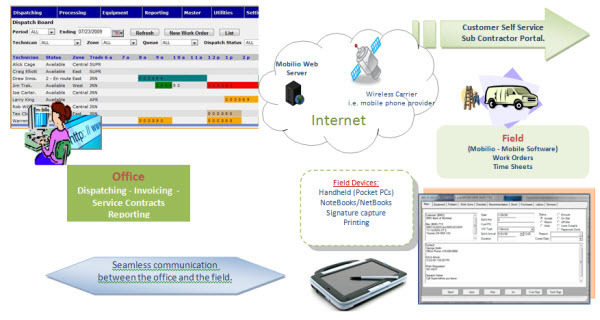 With portable devices in the field you can have printers, signature capture and the flexibility of multiple methods of internet connectivity.